March 27, 2017; Crafting a thrill around the lanes of Indian Cricket, Kuldeep Yadav became the first ‘chinaman’ to play a Test match for the India men’s national team. His contribution to the team became even more special, as he picked up four wickets against the Aussies. The ‘chinaman’ is a rare sight in cricket. Made famous by the likes of Sir Garfield Sobers, Michael Bevan, and Brad Hogg, the chinaman is a delivery bowled by a left-arm wrist-spinner. And, given its rich tradition of spin bowling, it is really surprising that the subcontinent till recently did not have a single Chinaman bowler in their test history. 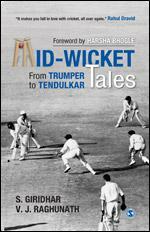 “Mid-wicket Tales: From Trumper to Tendulkar” by S. Giridhar and V. J. Raghunath interestingly has a chapter dedicated to the chinaman bowlers with facts and quaint anecdotes about this rare tribe of bowlers. The chapter concludes with a tribute to Mumtaz Hussain, the wonderfully talented spinner from Hyderabad who was perhaps the one Chinaman bowler in India who came closest to a Test selection more than 45 years ago. And now Kuldeep Yadav has burst upon the scene and in one magical spell, became the toast of the nation! “Mid-Wicket Tales” is written with the passion of a fan and knowledge of a cricketer. Covering almost every aspect of the game, this book is for all genuine lovers of cricket. It celebrates cricket in all its hues and brings alive the rich history, romance and technical nuances of the game, where diligent research and analysis is blended with rare and interesting anecdotes. This book will ensure that its readers forget neither the rich traditions of cricket nor the players who have contributed to uphold the culture of this fascinating sport.